‘ANONYMOUS SOURCE’ WANTED TO POINT THIS AND ANOTHER ARTICLE OUT AS THEY ARE VERY RELATED TO WHAT IS GOING ON WITH THE GLOBAL SETTLEMENT ACCOUNTS/COLLATERAL ACCOUNTS….not to mention GLOBALLY! It has been asked by ‘Anonymous Source’ that ‘We The People’ of the World make all this information viral as I put it out!! We Thank everyone of you for all your help in getting this information out to the public and waking up The People!!! Given the current state of the world today, it is clear to just about anyone that something is going to happen. But just what will happen? I’ve been chasing down some interesting information, most of which can only be presented in theory form. The reason for this is that the mainstream media is heavily controlled, and the only way to try to get to the real information is through a variety of alternative news sources and the internet. When gathering information in this way, it is not always packaged together in an easy-to-digest format. I am attempting to do that now for you in this document. In addition, there is a lot of secrecy in the world, and not much information is freely available. Some of this information is from “inside sources” who claim they can’t tell you everything. Wherever applicable, I have provided links to documentation so that you can track down these sources of information on your own to help you to form your own conclusions. So given all of these factors, my goal here is to present you with theoretical pieces of the bigger puzzle, help you put those pieces together, give you a summarized extent of how far I got with my research in each area, and then ultimately it is up to you to make a decision on what you choose to believe. Whether you consider yourself to be a “money person” or not is irrelevant. The truth here is that every single problem we face in the world today, be it the environment, disease, poverty, war or tyranny comes down to one thing: Money. If you trace each one of these problems back far enough, you’ll find money as the root cause of the problem. The reason why the environment is trashed is because of the greed of those who wanted to make more money. People are sick because taking care of them with “modern medicine” generates more money for the medical industry. War is the biggest money making machine around. The truth is (and I’m going to prove this later on this document) THERE IS PLENTY OF MONEY FOR EVERYONE AND EVERYTHING. Money doesn’t “run out”. It goes somewhere, doesn’t it? So where did all the money go? Keep reading and I’ll show you where it went. Once you drill down through each level, you’ll find the money. Then, if you drill down further than that, you’ll find the ultimate motive: The desire of a select few to have power and control over the people of the world. First let’s start with the imminent total global financial collapse. This is real. This is not a theory. This is going to happen. The only theoretical part of this story is when it will happen. My best guess is that it is going to happen between October and December of 2012. This is a brief explanation of what happened in our economy in the last ten years. Most importantly, this is UNLIKE any other depression or recession. I want to make sure that I clearly explain the enormity of our current crisis; this time is much worse than any other crisis the world has ever faced. Why? Because of the catastrophic size of debt that was allowed to accumulate once they lifted the regulations. Let me try to simplify how this economy got so screwed up. We used to have rules and regulations that protected bad guys from gambling all our money away. We lifted all those rules and regulations and the bad guys swooped in and gambled all our money away. Since our money is no longer backed by gold or silver, the bad guys can just keep printing more money out of thin air to give to their bad guy friends to gamble it away. We, the taxpayers, were left with the bill of all the money they printed out of thin air and gambled away. And now our money has been made completely worthless because of all the money they printed. Oh and by the way, not one single bad guy has been punished for what they did. Of course, there’s a heck of a lot more detail that can be added to this, but this is pretty much what’s happened. You can read a little more here, plus here are some great documentaries on the subject. Why is the economy so bad? Sure, we’ve had economic collapses all throughout the world at one time or the other, but never anything like the one we are in store for. But what makes this one different? Well for starters, it’s not going to happen in just one country. It’s going to happen to the whole world. The reason for this is we have centralized and globalized everything. So few things are separate from each other and trade lines are very blurred. As a result, if one country goes down, they all go down. Yes. That most certainly includes America. The other problem we have that makes this one different is the derivatives market and the colossal size of the money to be lost in this crash. The derivatives market, which represents all of the bad gambling debts that are going to be called in which will ultimately cause the crash, is estimated to be 600 Trillion dollars. Wait. Go back. Read that last sentence again. That’s 600 Trillion with a T.
In his epic work Financial Tyranny, David Wilcock does an incredible job describing just how much money this is and how much we could have done with this if it had been given to the people and not the banks. 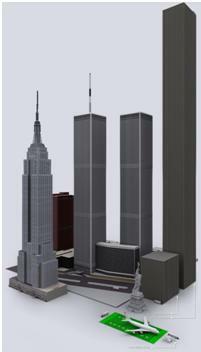 The picture below is borrowed from his blog showing stacks of $100 bills twice the height of the twin towers. This is what 600 trillion dollars looks like. As for comparing the coming economic collapse to the great depression, they didn’t have the huge debt market back then that we have today. Also, they had budget surpluses during that time; we don’t have any. Also, America still had a manufacturing base back then, so we built our way out of the depression. We don’t manufacture anything in America anymore; we’ve shipped all the manufacturing plants overseas. And here’s the last big clincher, back then after they had already fallen into a great depression, unemployment was at 27%. Today, in our supposed “recession” if you count REAL unemployment (not the unemployment they try to downplay in their reporting), unemployment is at 25%. How will this affect my everyday life? Now this next part is very important. For some reason, many people hear all this news and they think of these things as some external event that is happening “over there” that will not affect them in their everyday lives. The reason for this is most probably because most of the people alive today do not remember what it felt like to live in the depression, so this stuff is not real to them. Also, most people do not remember or know what it feels like to have war on their own soil….